Last night I completed my first detailed model in Cinema 4D. This is near-exact replica of the radiator from my apartment bedroom, which is 73 years old and covered in multiple thick layers of leaded paint. The model took me far longer than it should have. 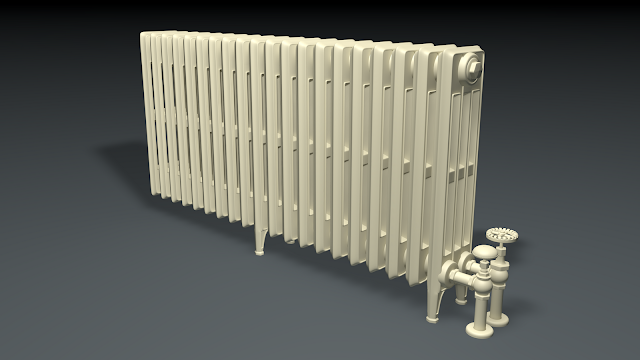 After taking many reference photos of the actual radiator, I determined that using loft NURBS would be the best way to go about creating the radiator panels. I was wrong. Because of the holes in the radiator panels, I had to create multiple lofts and make sure they all fit together (which wasn't hard). What was difficult, was that the loft NURBS were bulging where I didn't want them to, and the final splines of the loft were being curved out to instead of in to. So after conversing with the nice folks on the C4D Cafe forums, I turned to hyperNURBS for the main radiator panels, which worked far better once I got the hang of using the knife tool appropriately. I duplicated the panel and created a version with feet, then used cloner and an instance object to fill out the rest of the panelst. All of the other parts of the model were created using loft NURBS. It was a great learning experience. I still have to create proper textures for it (an idea I still find a daunting), but first I'll be modelling the rest of the bedroom. If you're interested in downloading the model to explore and learn from, or simply to use (under a Creative Commons Attribution-NonCommercial-ShareAlike 3.0 License), you can grab it from my deviantART page.